The Ministry of Health of Ukraine signed a memorandum with the American Society for Clinical Pathology, which stipulates the provision of support to Ukrainian specialists in laboratory diagnostics, the press service of the ministry has reported. 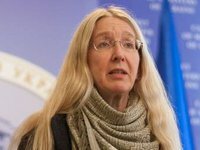 "I want to remind you that one of the tasks of our healthcare reform is the prevention or detection of diseases in the early stages, so timely and accurate laboratory diagnostics is critical, since it reduces the overall costs for treatment," Minister of Health Dr. Ulana Suprun said. She also noted that world experience proves that optimization of laboratory departments and implementation of the quality management system will allow improve the quality of work by 20%. In addition, Suprun stressed the introduction of a quality system based on international standards, and the accreditation of laboratories, which will reduce the operational costs of the laboratory and the number of false results, improve the management of laboratories and the quality of the provision of medical services to the patient. "Now, according to the results of numerous international assessments in 2015-2017, the system of national laboratories meets the requirements of international standards only by 50-60%," the Ministry of Health said in a statement. According to the ministry, there are now more than 5,000 medical laboratories in Ukraine - public and private. Only three laboratories of them - one private and two state ones - are accredited in accordance with ISO 15189. The process of accreditation of seven more laboratories has been started. "The American Society for Clinical Pathology is ready to help Ukrainian specialists in laboratory diagnostics to improve their knowledge and improve their quality management skills in laboratories," the ministry said.